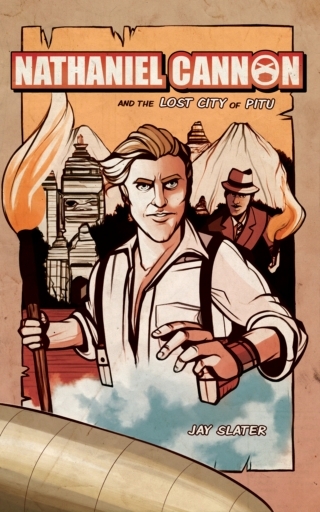 Nathaniel Cannon and the Lost City of Pitu Released! The year is 1929. In the aftermath of the Great War, the world rebuilds, and the mighty zeppelin is its instrument. Carrying trade between every nation, airship merchantmen attract an old menace for a new age: the sky pirate. One man stands out above the rest. Ace pilot, intrepid explorer, and gentleman buccaneer Nathaniel Cannon and his gang, the Long Nines, prowl the skies in hot pursuit of wealth and adventure. Cannon receives word from a sometime friend in Paris about a job in the Dutch East Indies. The contact tells a tale of a mysterious lost city, bursting with treasure, not seen by human eyes for a thousand years. Will his tip pay off? Or will it lead the Long Nines straight to a fight for their lives, lost in the unfriendly depths of the Indonesian jungle? Nathaniel Cannon and the Lost City of Pitu is available now, at Amazon, Barnes and Noble, Apple iBooks, Kobo, and Smashwords, for $1.99. The Skypirates world is my favorite place to set stories. I’m excited to share this one with you. Don’t forget you get two exclusive, never-before-seen short stories with your purchase, which shed some light on how two characters found their way into Nathaniel Cannon’s orbit. If you enjoy the book, please don’t forget to leave a review or rating at your merchant of choice. Thanks again for your patronage. See you this winter for the e-book release of Nathaniel Cannon and the Secret of the Dutchman’s Cross.